It’s an easy thing, this time of year, to semi-hibernate your way through the dark months of a Wisconsin winter. It can be the path of least resistance to just hunker down with your favorite blanket, a long read and plenty of strong coffee to sustain…. 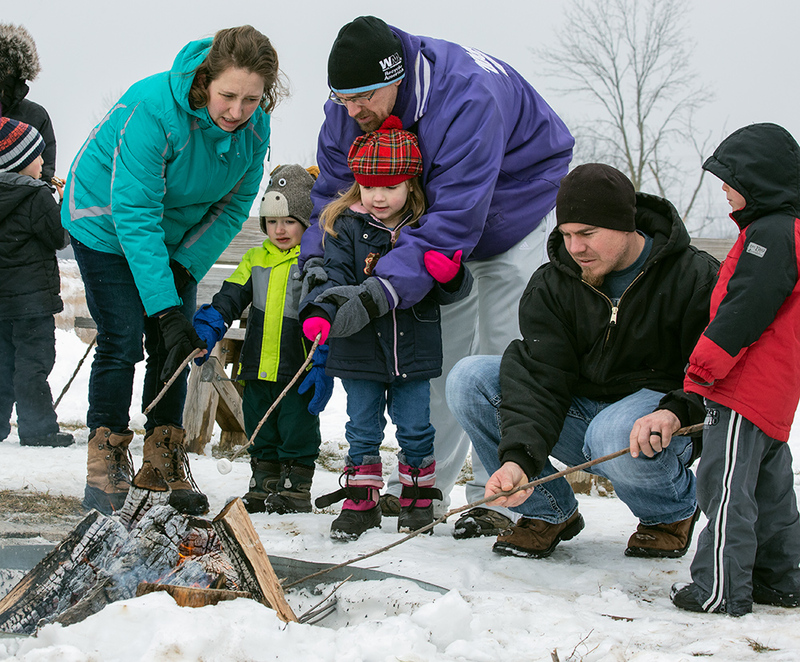 But after some heavy snows followed by bitter cold and endless school and activity cancellations, it seems families in southeast Wisconsin had had enough and were ready to bust outside and play! 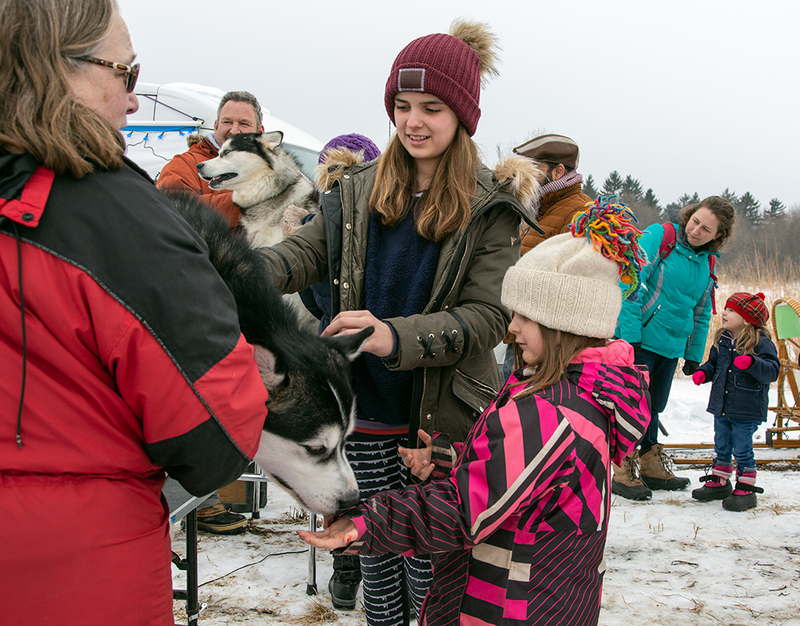 A perfectly-timed break in the weather coincided with Mequon Nature Preserve’s seventh annual Winter Frolic on February 2, and the joy was palpable. 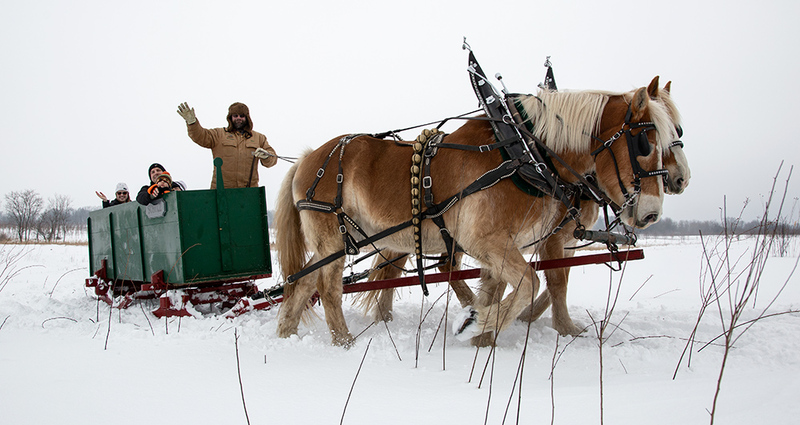 An estimated 3,000 Frolickers descended upon the 444-acre playground that bridges “city” and “suburb,” and they played away the winter blues enveloped in a carefree day of fresh air and new experiences. Shuttle bus doors gave way to mobs of rambunctious children, who ran through the hallways of the education center, gesturing excitedly at the mounted deer and the owl and the sand hill crane before heading outside. 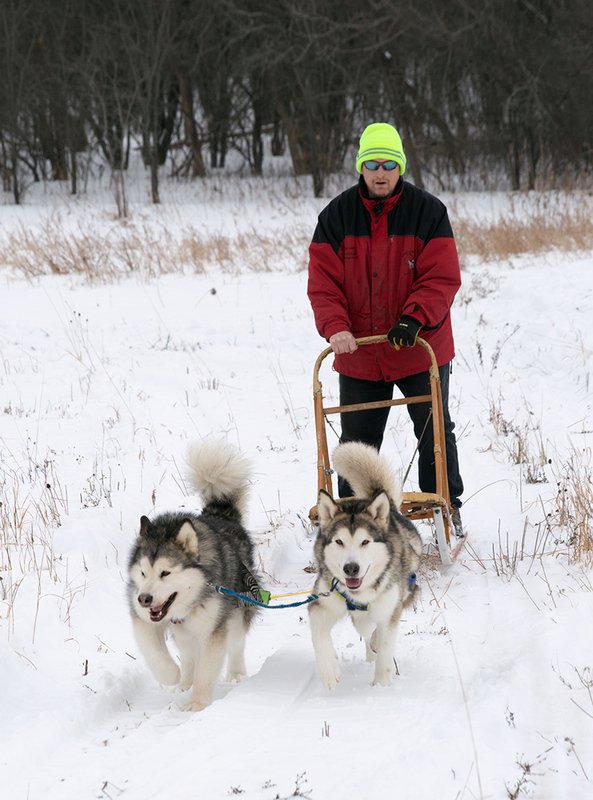 In the distance, you could hear the eager yips of the dogs from the Alaskan Malamute Club of Wisconsin, ready to do their thing; and they did not disappoint! 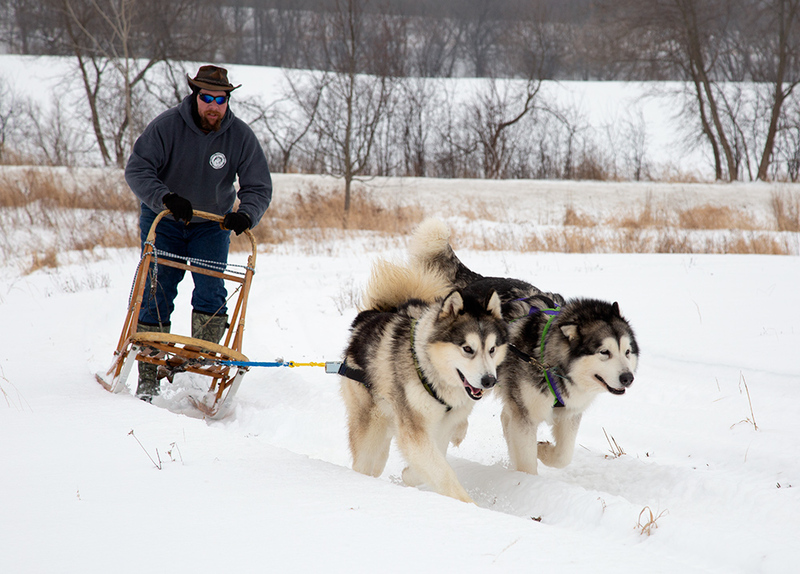 The dogs put on an entertaining show of strength, towing musher and sled with an inspiring amount of enthusiasm for their work. Even the newbie teams were fun to watch, making up for a lack of sled-pulling experience in patient acceptance of ear scratches from their adoring audience. 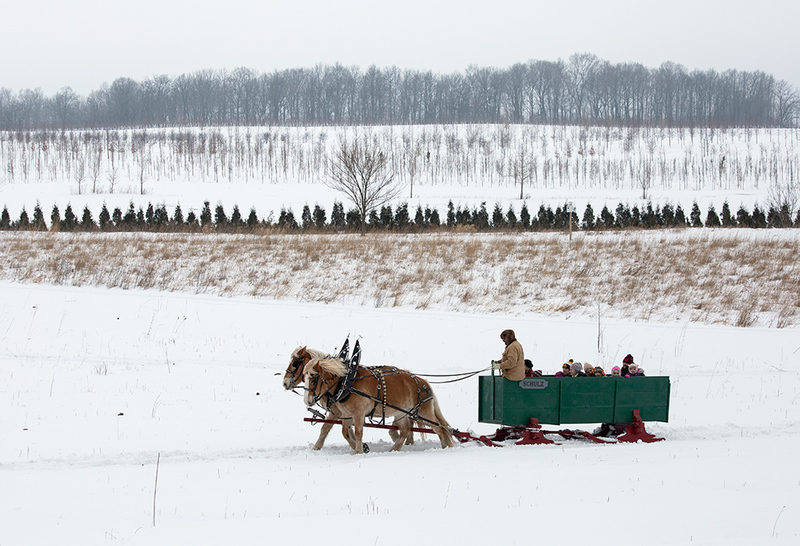 Hay wagon rides pulled by a massive Case tractor provided Frolickers a view of the winter-swept land, dropping them off at the Preserve’s iconic tower for a race to the top where you could see for miles from the highest viewing platform 40 feet up. It’s an amazingly different sight if you’ve only taken in this panorama during the summer months! The City of Mequon Fire Department showed off their impressive rig, raising the ladder stories above the event and awing children with a peek inside at their arsenal of gear and equipment. 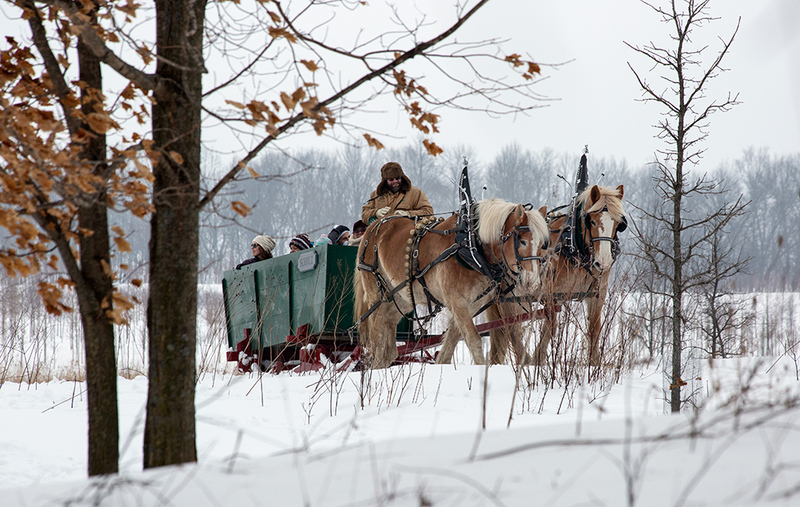 The longest queue of the day was for a quick loop in a festive green sleigh pulled by a sibling team of Belgians, Lily and Peter. 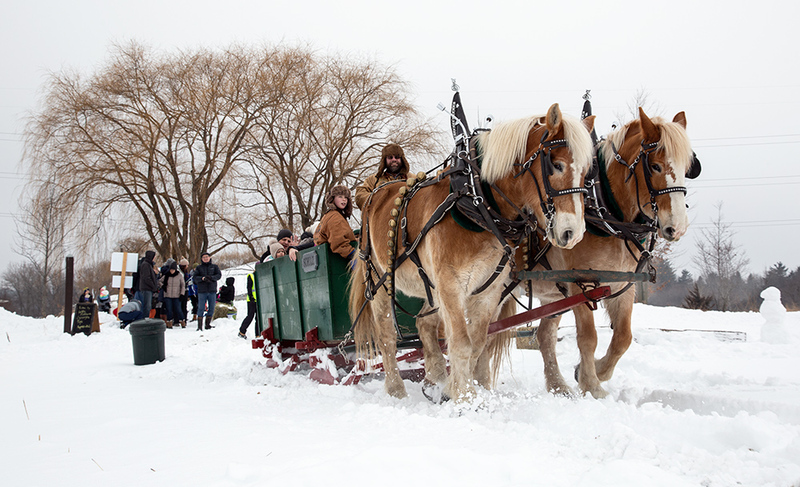 As they jingled their way through the snow, the scene felt as though you’d stepped into a greeting card, complete with happy hearts and warm memories. Patient festival-goers became resourceful in entertaining themselves while waiting in line with some spirited snowman building and snowball flinging. As it turns out, the addition of a formal “Snowball Arena” as one more attraction previously considered by staff was not necessary, after all. Nearby, a warming bonfire alternated between smolder and blaze as Frolickers aspired to build the perfect s’more. Even when the marshmallow burst into flame (intentional or not), the delectable creation never disappointed; everyone knows (or so it was thought) that s’mores are created equal in their delicious-ness. There was the occasional, scandalous discovery that some of the visiting children had never even heard of a s’more, but this was quickly remedied as they were handed an official roasting stick with all the fixings. Ah, happy stomachs and sticky fingers all around! 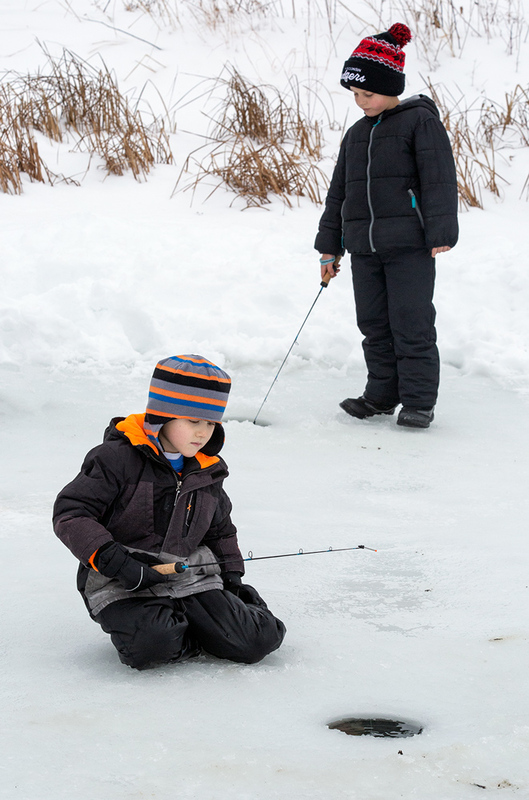 For many children that Saturday, the chance to try ice fishing was their first. Each was stationed at a hole in the ice with a jig pole and provided 30 seconds of the most relevant ice fishing pointers by staff and volunteers. It’s amusing to see how universal that posture of leaning over the hole and peering – so hopefully – into the water can be, even from those so small in stature and new to the sport. There were even a few pint-sized fish pulled through the ice by the pint-sized fishers, making the experience complete. 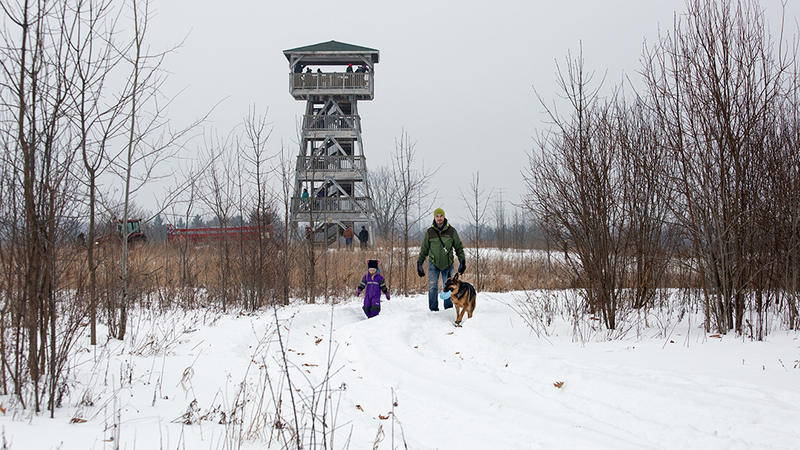 There are plenty of happy days at Mequon Nature Preserve—virtually all of them, in fact. But to see and be part of so many who were so happy to be catching their first bit of fresh air in days and running off all their energy that was just waiting to get out…. This was a good day. 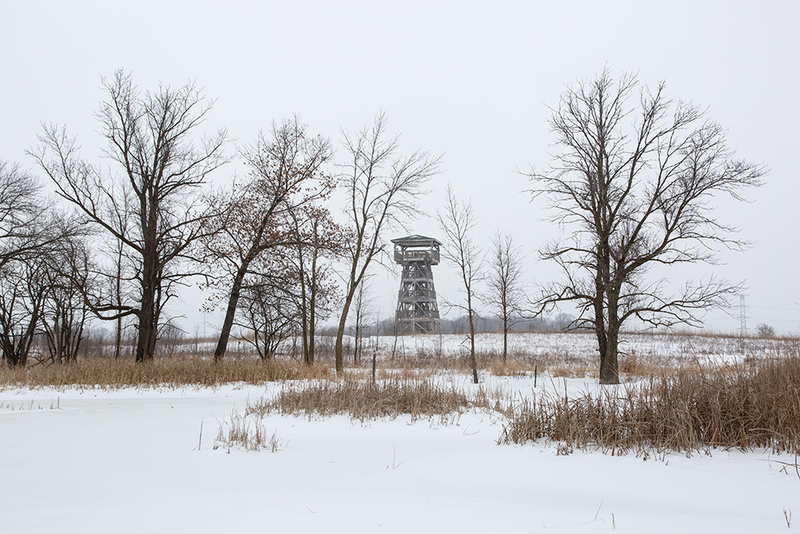 Mequon Nature Preserve is dedicated to the restoration of its 444 acres to pre-settlement conditions that include wetlands, prairies and forests. The landscape is free and open to the public, with more than five miles of trails that are open every day of the year from sunrise to sunset. The PieperPower Education Center is open Monday through Friday from 8:30 am to 4:30 pm. MNP is a non-profit entity that receives no tax dollars and depends fully on the generous support of donations and grants. 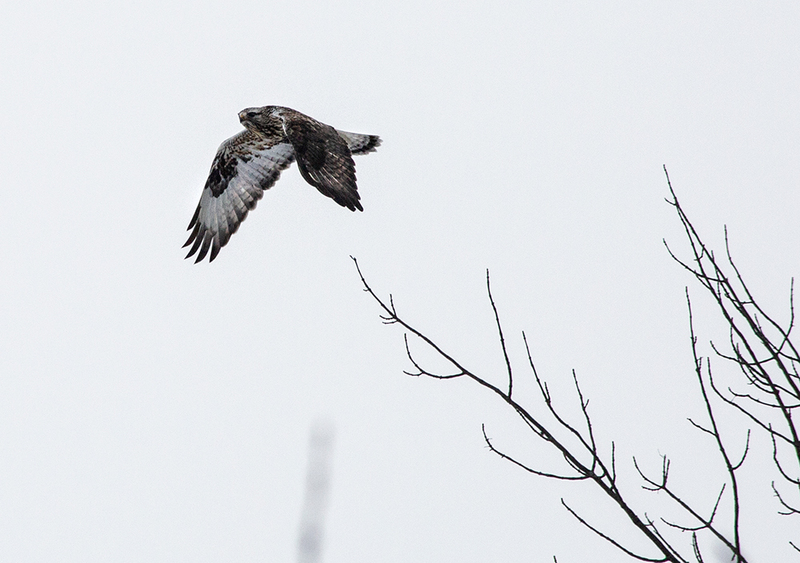 For more information about MNP, visit mequonnaturepreserve.org or find us on Facebook and Twitter. 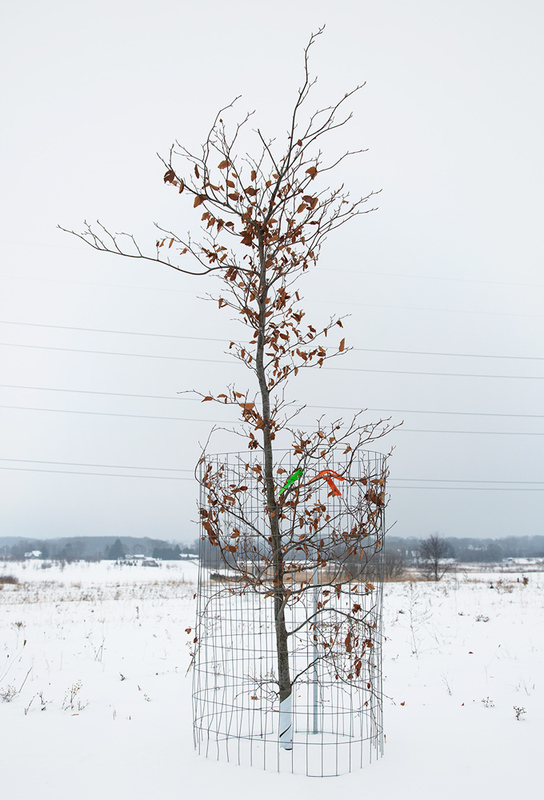 Kelly Winkler is the Marketing and Development Assistant for the Mequon Nature Preserve. Eddee Daniel is a board member of Preserve Our Parks and A Wealth of Nature project director.